The Gilded Age is in the air! This beautifully designed, fully illustrated, insightful book by noted historian Alan Axelrod provides a vivid view of American life and thought during that era. 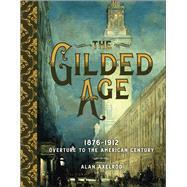 The Gilded Age—the name coined by Mark Twain to refer to the period of rapid economic growth in America between the 1870s and 1900—offers some intriguing parallels to our own time. Prolific historian Alan Axelrod tackles this subject in a fresh way, exploring “this intense era in all its dimensions. . . . This book will reveal it . . . as, truly, the overture of the ‘American Century.’” He also looks at how it presaged our current era, which many are calling the “Second Gilded Age.” Photographs, political cartoons, engravings, news clippings, and other ephemera help bring this fascinating period into focus. Alan Axelrod is the author of more than 65 books, including Profiles in Audacity and the CEO and Real History series (all Sterling). He was the coauthor of The New York Times bestseller What Every American Should Know About American History (with Charles Phillips; Adams Media Corporation) as well as the Businessweek bestsellers Patton on Leadership and Elizabeth I, CEO (both Prentice Hall). He has appeared on MSNBC, the Discovery Channel, CNN, Fox, and numerous radio news and talk programs, including NPR. Axelrod and his work have been featured in Businessweek, Fortune, Men's Health, Cosmopolitan, and many newspapers, including USA Today.